Familiarity with basic commands (such as cd, dir, mkdir, findstr) and with the Command Prompt (aka "Windows Command Processor", "cmd.exe", "MSDOS Window"). If you haven't already done so, start a Command Prompt Window now. 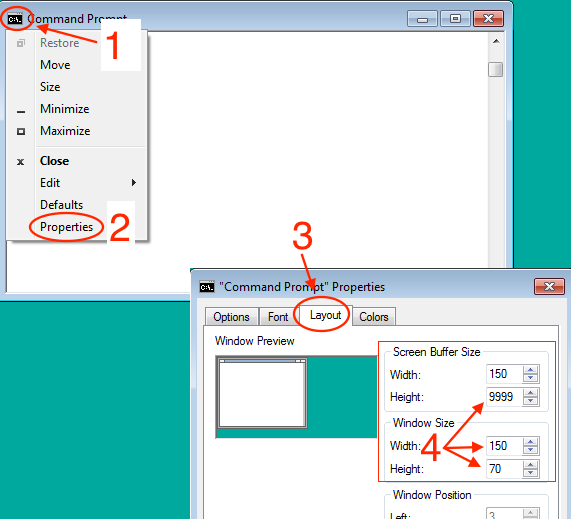 For Windows 7 and earlier versions, use the search bar by clicking Start and typing "Command". The option for Command Prompt will appear. Click on it. For Windows 8.x and Windows 10, from the desktop, right click on the start button and click on Command Prompt from the pop-up menu. Tip: you will probably find that the window is easier to use if you enlarge it. Click the upper left corner of the Command Prompt window. Increase the sizes. For example, you could use the values shown in the screen shot on the right, if you wish. If you have the sha512sum or sha256sum utility, use it to calculate a checksum for your download. You might be able to access the utility by right-clicking on the ISO image. Compare the checksum to the posted value at www.spec.org/cpu2017/releases. On Windows 8.x, Windows 10 and Windows Server 2012, the ISO file can be attached as a drive. To do this, open Windows Explorer and navigate to the directory where the ISO file was downloaded. Then, either double-click on the ISO file, or click on the ISO file and select "Mount". On Windows 7 and earlier versions, third party software is required. This document makes no recommendations about particular add-ons. Regardless of the method you choose, note the drive letter where the ISO image or the DVD is attached. The following tasks must be done from the Command Prompt. Do not attempt to run install.bat from Windows Explorer. If you see a message similar to the above, just press return. If you see error messages, check to be sure that you are in the correct directory and that %temp% is defined. After you press return, the installation begins. No more questions are asked. As it proceeds, the install procedure tells you what benchmarks are being unpacked. the destination device, this may take several minutes. At this point, the CPU2017 installation will be using about 2.2 GB of disk space on the destination drive. and make the appropriate edits for your compiler paths. q. When I try to edit shrc.bat, it looks like the lines are not correctly formatted. The text appears to be all run together. For example, this can happen when using notepad. a Try wordpad. For more information, see the section below: About Text Files and Windows/Unix Compatibility. by removing "rem" from the beginning of the desired line. It is usually better to call a vendor-supplied batch setup file, because the file may set additional needed variables, such as INCLUDE and LIB. Examples of vendor files, such as iclvars, vcvars, and vsvars, are in the comments within shrc.bat. Do not assume that any of those examples will work on your system: you need to check first. The names and locations of these files change from compiler to compiler, from version to version, and even from system to system (if you choose a non-default installation directory). Be sure to set all needed variables. Check your compiler documentation. Be sure that you do not have any semi-colons (;) inside of quotes, as that may cause mysterious errors. No matter how your path gets set, in general it is a good idea to understand what is in your path, and that you have only what you truly need. If you have non-standard versions of commonly used utilities in your path, you may avoid unpleasant surprises by taking them out. By default, shrc.bat will print the path after it is done. If you would prefer that it not do so, you can set SHRC_QUIET=yes in your environment. From this point forward, we are testing basic capabilities of the installed version of SPEC CPU2017, including compiling benchmarks and running them. Select a benchmark to try first. Begin with a benchmark that compiles quickly, such as 505.mcf_r or 508.namd_r for SPECrate; or 619.lbm_s for SPECspeed. Example: Here, the user starts with a config file for Intel C/C++ and Fortran 17.0 Update 1 Compilers for Windows, edits it, and tries 508.namd_r. Locating benchmarks...found 47 benchmarks in 58 benchsets. Running "specperl c:/CPU2017/Docs/sysinfo" to gather system information. You have established that SPEC CPU2017 is installed and the tools can use your config file to find a "C" compiler. An executable file has been created, using a label that was specified by the config file (Example-ic17.0u1-win-rate) The label is just an arbitrary tag that you can use to help you keep track of your builds. Confirms that we do not want a full, reportable run (--noreportable). Runs each benchmark only once (--iterations=1). Note above that compiling the SPECrate2017 Floating Point benchmarks and running the brief test workload took about 3 hours (10532 seconds). Your time may be considerably different (faster or slower), for example when using other compilers or building other suites (recall that there are 4 suites in CPU2017: intrate, fprate, intspeed, fpspeed). The time required to do a build also depends directly upon the config file optimization selections. see the 'http_proxy' entry in config.html. The above message is expected if you are behind a firewall. For a reportable run, all three workload sizes are run. For test and train, the only requirement is that they generate valid output. They are not timed. In the next section, the test workloads are run. The test workload is not timed. After the train workloads are done, the timed, "refrate", workloads begin. The run completed successfully. On this particular (year 2016) hardware system, a 10-copy reportable fprate run, using base-only tuning, required about 10 hours (35529 seconds). Much more time would be needed if the run used both base and peak tuning, or used more copies, or asked for additional suites (intrate, intspeed, or fpspeed). There are many files in the SPEC CPU2017 distribution that contain text. Unfortunately, Unix systems and Windows systems have different conventions for storing text files. Sometimes, a text file formatted for Windows will appear on Unix as if it has extra Control-M characters. Sometimes, a text file formatted for Unix will appear on Windows as if all the lines were joined together. Use the MS-DOS Editor. Open a Command Prompt and type "Edit". This alternative does not work on 64-bit Windows systems. The program only recognizes files with 8 characters or fewer, a dot, and then 3 characters or fewer. If you are trying to use it with a longer file name, you can discover that there is an "8 dot 3" synonym for it by typing: "dir /x". Use the editor "vi". Although vi originated on Unix systems, there are also Windows versions. "UNIX Compatibility" products for Windows often include a version of vi, and there are independently-distributed versions, such as "Vi IMproved" (at http://www.vim.org/). Note that SPEC does not "endorse" any of these solutions, although it is hoped that at least one of them will be useful for you.